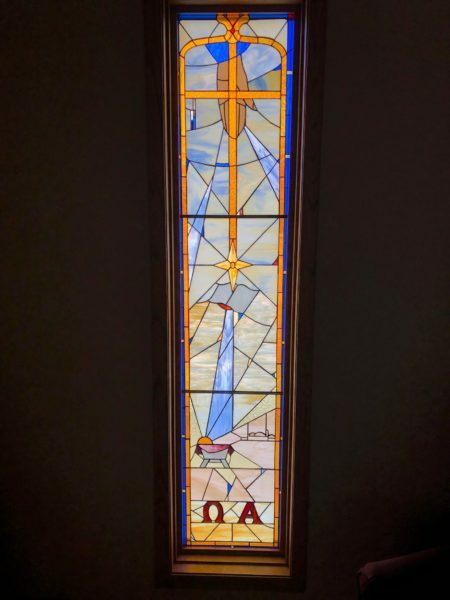 Glee Grau and the Windows | "Northern Crossings"
This window was put together from memories from Sandy Miller O’Keefe of a time when she and her husband Randy Miller and a conversation they had when they saw a marvelous display of God’s glory in the sky by Grand Forks just before he died. Now I got this from a former member at Trinity. Glee Grau, 86, formerly of Dickinson, passed away March 13, 2019, surrounded by her family at CHI St. Alexius, Bismarck. > The fourth of nine children, Glee was born April 3, 1932, to Ingeborg and Ray Atwood and raised on a farm near Tolley. > With her teaching degree from Minot, Glee first taught in a one-room country school. Later, while teaching in Enderlin, she met North Dakota State University student, Roger Grau. They married June 19, 1955, in Tolley and began a beautiful 61-year journey together, first in Denver and Fort Collins, Colo., and later in Dickinson. > Always a teacher and artisan, Glee shared her love of creativity with her daughters, Angela, LaVonne and Candace. She enjoyed oil painting, quilting, and volunteering at church when not helping Roger at the Coast-to-Coast store, but her creative soul was always ready for new challenges. In mid-1980s, Glee studied watercolor painting and stained glass. Lutheran. > She is survived by three daughters: Angela (Hank) Willenbring, Perham, Minn.; LaVonne (Rex) Ewing, Masonville, Colo.; Candace (Paul) Harron, Bismarck; and three siblings: Raymond Atwood, Lela Peterson and Larry Atwood. She was preceded in death by her husband, Roger, in June 2016. > Memorials may be directed to Martin Luther School in Bismarck or the Alzheimer’s Association Minnesota-North Dakota chapter. Church. Visitation one hour prior; reception following. > Arrangements are with Ladbury Funeral Service, Dickinson. I am sorry to miss the funeral but appreciate the announcement. Why Would Anyone Be Upset at Trying to Help Orphans? Mercy and Maundy Thursday and Luther.